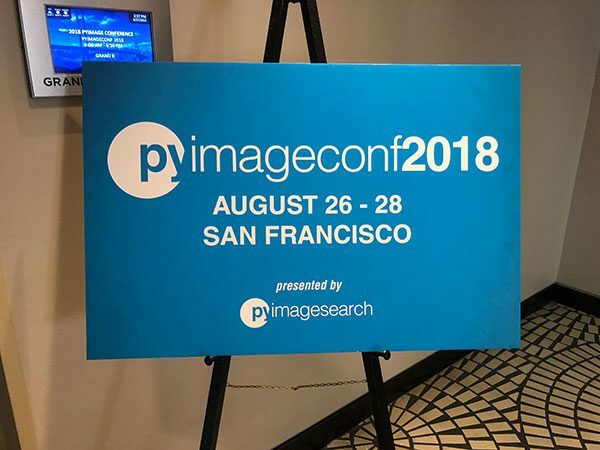 PyImageConf 2018, PyImageSearch’s very own computer vision and deep learning education conference, took place August 26th-28th in San Francisco, CA at the Regency Hyatt. It was an amazing conference and based on attendee feedback, it was HUGE success. 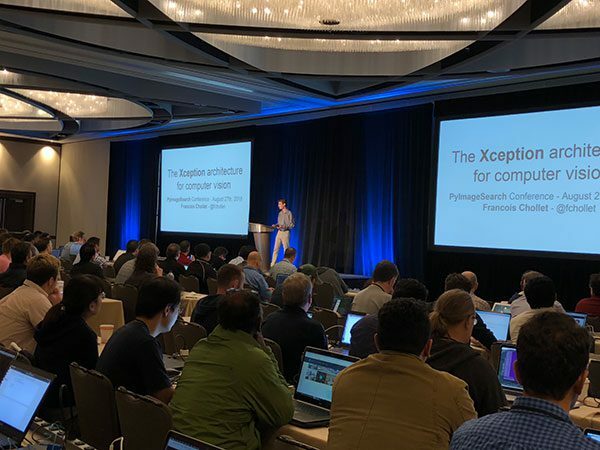 Today I want to recap the conference, share some highlights, and perhaps most importantly, discuss aspects of the conference that went well…as well as areas that need improvement or I would do differently if there were to be a future PyImageConf. While today’s blog post is partly a recap, it’s also (in essence) a letter to my future self, reminders of what to double-down on and what I can do better. 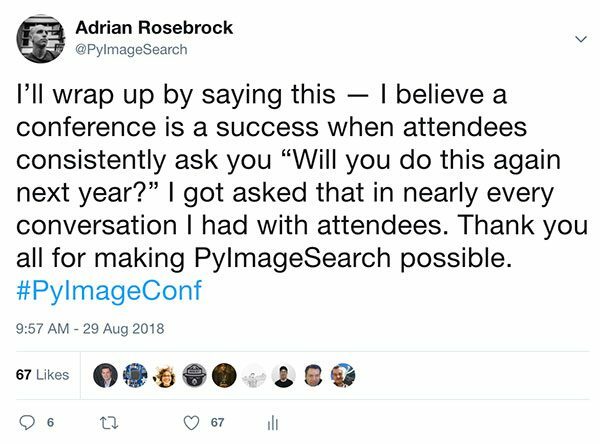 PyImageSearch, and now PyImageConf, is not about me — it’s about you the attendee and PyImageSearch reader. All of this is for you. 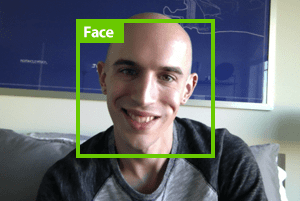 I may be the “face” of PyImageSearch, but you’re far more important. You are what makes this blog, the books and courses, and most importantly, the community possible. Thank you for being here, thank you making this all possible, and thank you for giving me the privilege and honor to teach you. 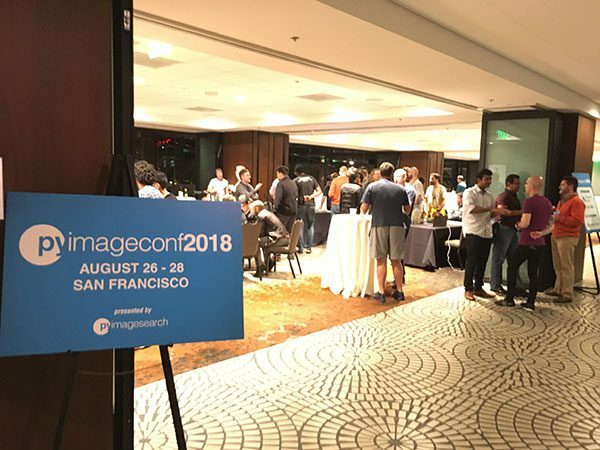 Figure 1: PyImageConf 2018 took place August 26-28th in San Francisco, CA. The three day event included talks, workshops, and evening receptions every night. The idea for PyImageConf started three years back, and to be totally candid, it wasn’t even my idea. Jeff Nova, a PyImageSearch Gurus member and owner of San Francisco-based Colorhythm, reached out to me and asked if I would ever be interested in doing an in-person, live teaching event (Jeff had access to a large classroom capable of holding 50 students). At the time it wasn’t something I could do. I didn’t have the time or mental capacity for it. I was overloaded as is. And perhaps like all good ideas, we let it fall to the wayside for a couple years. Then, last August, I called Jeff and asked him if he was still interested in doing an in-person event, but scaling it up a bit to the point where we were hosting an actual conference. I knew I needed Jeff to pull the event off, and when he said “Yes” we put in motion PyImageConf 2018. My goal was to keep PyImageConf small, intimate, and hands-on. In essence, I wanted PyImageConf to be the computer vision and deep learning conference I always wanted to attend. I wanted to keep the conference small and intimate, capped at 200 attendees. Ultimately, I believe keeping the conference small was the absolute right decision. A huge shout out to Adrian and everyone who worked so diligently to put on on of the BEST conferences I have ever attended. A wonderfully small and intimate conference where you really could talk to the presenters and ask questions. The other big plus of a small conference is you have many more opportunities to meet fellow practitioners and share ideas, tip and tricks. It is easy to meet someone who faced the same stumbling block and can help you , or you have something to share from your experiences. If you missed this PyImageConf, I am sorry, you really missed something. If there is another, don’t miss it! NVIDIA GTC can be an overwhelming experience due to it’s size. PyImageConf provides an up and close experience. The presenters make themselves available to the attendees. PyImageConf provides an escape into the CV and DL worlds. 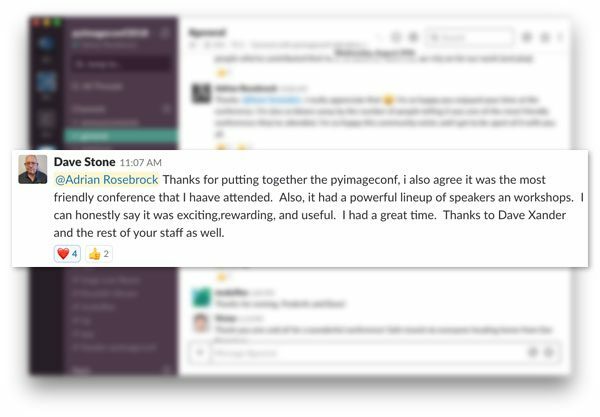 Once the vision of PyImageConf was formed, it was time to reach out to speakers and workshop hosts. Katherine Scott: Former analytics team lead for Planet Labs. Expert in satellite image analysis. Co-author of SimpleCV. If you see these speakers around online, please thank them for their time and energy they put towards the conference. PyImageConf would not have been possible without them. Figure 2: The PyImageConf 2018 reception, including an open bar and networking. Some attendees even brought their laptops to demo and share what they’ve created! The first day (or night, rather) of PyImageConf 2018 was the opening reception. From 6:30-9:30PM we hosted a three hour long reception, complete with open bar. The goal of the reception was of course to welcome attendees, but more importantly, to have attendees connect with each other, network, and build relationships. 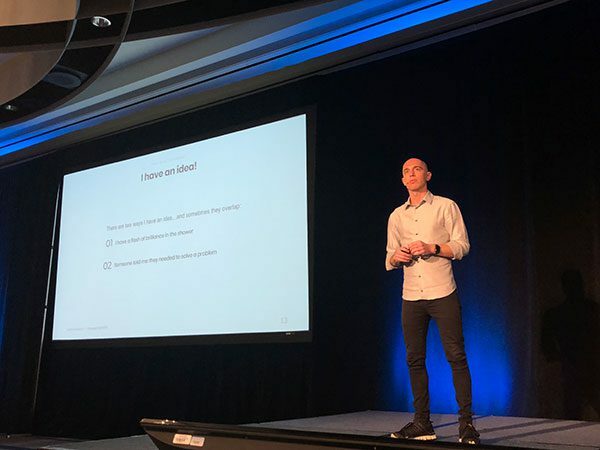 I often think the relationship building aspect is missing from technical and even academic conferences — in many respects, the connections you make with other people can be more valuable than the technical content in the long run. A graduate student talking to an employer, an entrepreneur talking to a contractor, or a researcher speaking with someone in industry are all conversations that can change the trajectory of your career. Networking and connecting with others should never be overlooked. I thought it was great that you set up the evening open bar and that all of the presenters showed up and participated in the informal discussions. I also enjoyed the additional time in the evening to talk with others and learn what they were doing, hear their challenges and pick up ideas for some of my challenges. Figure 3: One of my favorite aspects of PyImageConf was being able to meet readers in person! Day #1 was also the speaker dinner. Myself, the speakers and workshop hosts, along with their spouses went out to dinner together before the reception was fully underway. It was truly a wonderful dinner — being at a table surrounded by some of the most intelligent, successful computer vision and deep learning practitioners, engineers, and educators is something I will truly cherish. PyImageConf would not have been possible without these speakers so if you see them online anywhere, be sure to thank them. You may also be surprised to know that our conversations didn’t always center around CV and DL! While CV and DL may have brought us together, and certainly was the reason we were in that room, we also discussed more personal matters, including our lives, what we were doing, and what we hoped to do next. One conversation I know I will remember forever is with speaker Jeff Bass, someone I truly look up to. I’ve known Jeff for a few years. We originally met through the PyImageSearch Gurus course. As I got to know him, I realized that he’s had a truly remarkable life. He was a pilot, served in Vietnam, worked for Amgen for many years, and is now retired, building his own permaculture farm. Jeff’s stories and life experiences over the years helped me in many ways — and that to me is truly what it means to be human — to be in a room with a bunch of people with a common interest, but that interest is only the start, where it takes you could help you tremendously. Figure 4: The grand ballroom at the Regency Hyatt was absolutely stunning. Here I am on Sunday, a few hours before the reception gets underway. 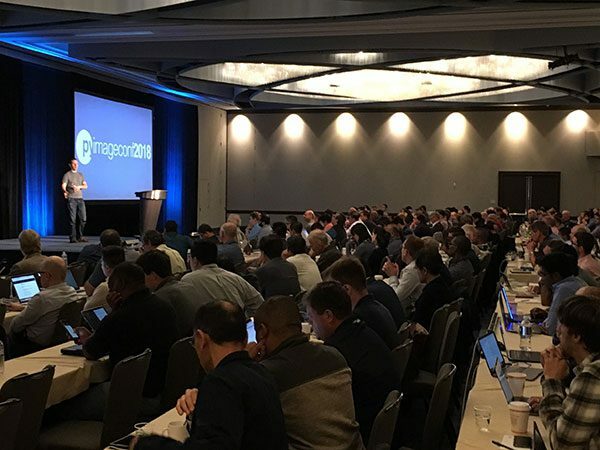 The second day of PyImageConf kicked off the talks which took place in the Regency Hyatt’s grand ballroom. When I saw the ballroom the night before I was blown away — it was beautiful and incredibly professional. 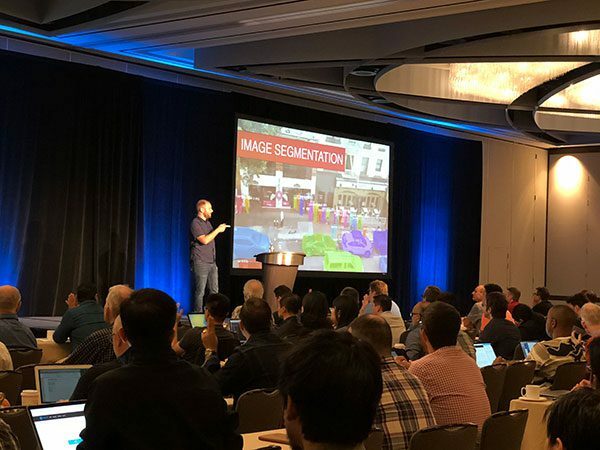 Adam Geitgey opened the conference with his talk on Image Segmentation using deep learning, and in particular, Mask R-CNNs. Figure 5: Adam Geitgey at PyImageConf 2018 giving his talk on Image Segmentation. Adam went through the entire semantic segmentation pipeline, starting with how segmentation is different than standard classification and object detection, then moving on to how to annotate your training data, how to train your Mask R-CNN, and finally how to apply it to your own images. Adam’s talk was the perfect opener for the conference and his talk set the tone for the rest conference as well — we were all going to learn a lot being in that ballroom together. Satya Mallick’s talk, Computer Vision: Real World Applications, discussed actual applications him and his team have worked on and solved using computer vision algorithms. 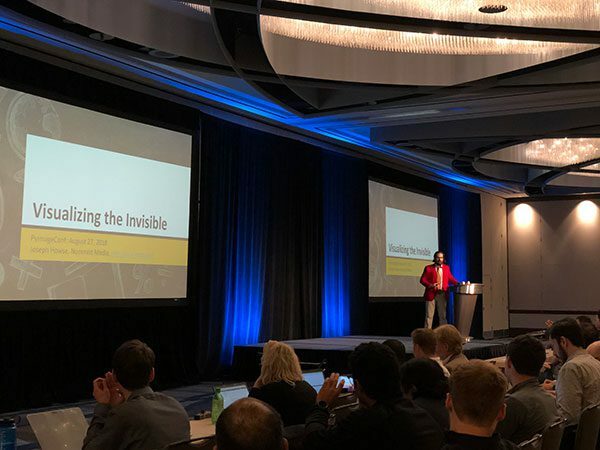 Figure 6: Satya Mallick, author of the LearnOpenCV blog and owner of Big Vision LLC, giving his talk on Computer Vision and Real-World Applications at PyImageConf 2018. And most importantly, Satya discussed some particular tricks he had to apply to effectively solve these problems as well. Davis King then took the stage for his talk, Training and improving your object detectors. Figure 7: There wasn’t an empty seat in the house for Davis King’s object detection talk at PyImageConf 2018. Davis reviewed the entire object detection pipeline, starting out with the fundamentals (i.e., sliding windows, image pyramids), working up to HOG + Linear SVM, and then finally deep learning-based object detectors. His talk was not only practical, informative, and useful, but it was also hysterical, including many funny quips and anecdotes from actual computer vision projects. We then broke for lunch and enjoyed an excellent catered meal by the Regency Hyatt staff. Again, this was was excellent time for attendees to network and connect with each other. 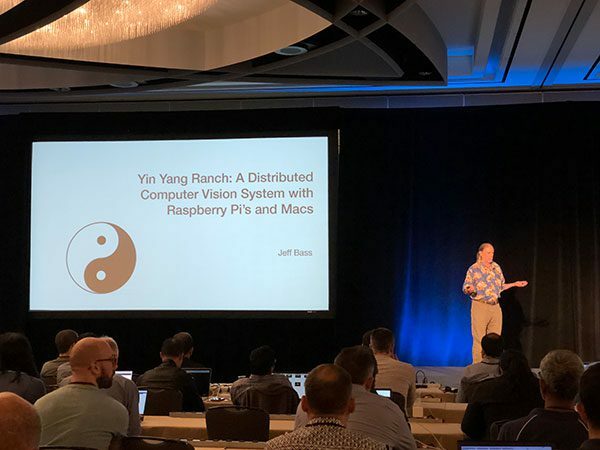 After lunch we came back to the ballroom where Jeff Bass discussed Yin Yang Ranch: Building a distributed computer vision pipeline with multiple Raspberry Pi’s and Macs. Figure 8: Jeff Bass discussing computer vision on the Raspberry Pi at PyImageConf 2018, including how we can build distributed computer vision systems. Tracking sunlight hours, sunlight intensity, cloud cover, etc. Jeff’s talk was truly something special — he not only discussed computer vision techniques but he also detailed how to glue all the pieces together! He even created his own Python library to efficiently share images/frames from a Raspberry Pi back to a central hub. The techniques learned from Jeff’s talk helped attendees build their own real-world computer vision applications. Joseph Howse followed Jeff with a talk on Visualizing the Invisible. Figure 9: Joe Howse discussed the concept of “invisible markers” and the role they can play in computer vision and augmented reality. Too often in computer vision we focus only on the visible — but there are forms of invisible light. So, what if we could leverage invisible markers that only appeared under a certain wavelength? Could we build augmented reality applications on top it? The answer is yes, and in his talk, Joe showed us the fundamentals of how we could build such an application (including an actual example and demo). Katherine Scott was next, giving a talk on Sensors >> Cameras and how computer vision is not just pushing pixels around. Instead, computer vision is the process of “analyzing light to get answers” — and before we even start pushing pixels, we need to consider how our image is captured. Figure 10: Katherine Scott challenged our assumptions that images must be 3-channel, 8-bit RGB data. Her PyImageConf 2018 talk was incredibly inspiring. In particular, our world is optimized for 3-channel, 8-bit RGB data, but there are other false-color techniques to explore. Kat’s talk was not only informative but inspirational as well. Francois Chollet, arguably a person who needs no introduction, creator of Keras and deep learning engineer at Google, gave a talk on The Xception architecture for computer vision. Figure 11: Francois Chollet, sharing technical details and the theory surrounding depthwise separable convolutions and their role in the Xception architecture. In particular, Francois’ talk focused on the concept of depthwise separable convolutions and how this technique enabled him to conceive the Xception neural network architecture, combining both residual connections and depthwise separable convolutions. This architecture, inspired by the Inception architecture by Szegedy et al., outperformed Inception and other architectures, requiring fewer parameters and less steps to train. Finally, I took the stage for the final talk of the day. My talk was entitled 7 lessons learned — My advice on launching your first computer vision or deep learning product. Figure 12: Adrian Rosebrock delivering his PyImageConf 2018 talk, 7 lessons learned — My advice on launching your first computer vision or deep learning product. On the PyImageSearch blog I typically teach you a particular algorithm or technique, but in this talk, I taught attendees how to bring it all full circle, and in particular, the importance of validating your idea before you write a single line of code or run a single experiment. I shared my experiences through the years, both the good and the bad, and after the talk, attendees had a framework they could apply when launching their own ideas or products. Day #1 was a huge success and I really want to thank the speakers for taking the time out of their busy lives to make the conference possible — thank you all! Figure 13: It was a packed house for Davis King’s, creator of dlib, PyImageConf 2018 workshop. Each workshop was totally filled to capacity and each workshop was designed to have you on your laptop, learning, writing code, applying a particular technique, and obtaining a result. In essence, the goal was to take the entire PyImageSearch teaching experience and bring it into a live, in-person workshop. 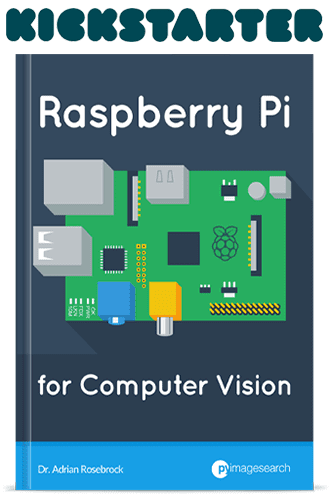 The workshop I had participated in was very hands-on and allowed me to set up my own computer-vision lab with well-documented code from which I can build. PyImageConf was a no-BS, hand-on conference for deep learning practitioners done by deep learning practitioners. I learned a lot of new things and improved my current toolbox with practical techniques used by the best in the game in their own code. The amount of new knowledge that I came home with me was invaluable. I was excited to come and I was not disappointed. The speakers were excellent. I really enjoyed the workshop on “Object Detection with faster R-CNN”, and learned a lot. It was a great community group, and the friendliest conference that I have attended. The point of this section is to highlight aspects of the conference that went all, including areas that could be improved for a future PyImageConf. Not only do I think it’s important share these details to you, the PyImageSearch reader, they are also notes to myself (as well as notes to anyone who may be interested in holding a conference in the future). One aspect that went extremely well is the diversity of topics. PyImageConf may be small but it packs a big punch. Adam’s talk on Image Segmentation set the tone for the conference by being hugely practical — the same is true for Davis’ talk. Jeff Bass’ talk explored how we can glue all the pieces together and solve actual real-world problems. Francois provided a highly technical discussion of the Xception architecture and how we can use it in our own applications. And Kat’s talk was nothing short of inspirational, giving us insights into how computer vision is more than just RGB data. This diversity of topics was a huge success and I have the speakers to thank for that. 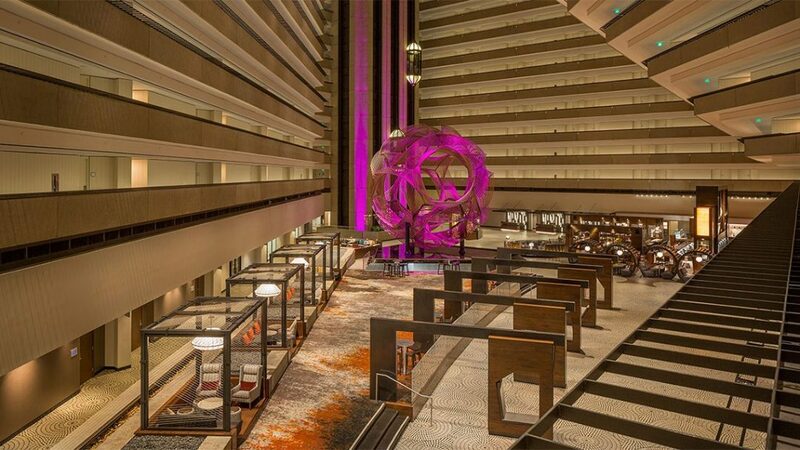 Figure 14: It’s hard to argue with the incredibly professional, aesthetically pleasing atmosphere at the Regency Hyatt. The Regency Hyatt was a great venue for PyImageConf. It was beautiful, highly professional, and their catered food was fantastic. I really enjoyed my time there and I know attendees did as well. Every night of PyImageConf there was a reception and open bar for ~2.5-3 hours. 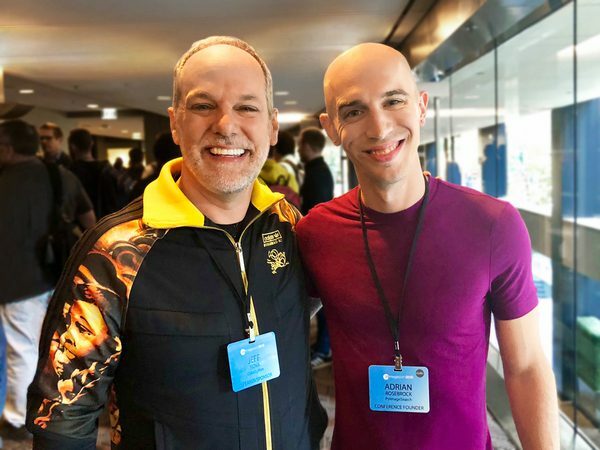 As I mentioned earlier in this post, I strongly believe in giving attendees the opportunity to connect an network. These connections can often times be more valuable than the actual talks and workshops themselves. 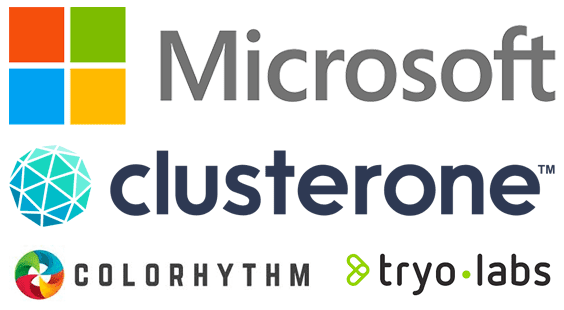 Figure 15: PyImageConf 2018 was sponsored by Microsoft Azure, Clusterone, Colorhytm, and TryoLabs. Microsoft even provided GPU instances in the cloud for attendees to use. All of these sponsors were a pleasure to work with. Thank you for making PyImageConf possible! One area that I would like to place emphasis on for a future PyImageConf is more ethnic and gender diversity — Satya was the only non-white speaker and Kat the only non-male speaker. Granted, there were only eight speakers total, but in the future I’m going to personally take it upon myself to ensure there is more ethnic and gender diversity. PyImageConf was certainly amazing and I fully believe that this group of speakers were absolutely perfect for the conference, but I also know moving forward that I have a responsibility to ensure more diversity. It’s something I do not take lightly and is absolutely an area I would like to work on. That said, there was certainly diversity in our attendees. Some attendees flew as far as Africa, Korea, China, Japan, Uruguay, India, and Australia. PyImageConf2018 was an absolutely amazing experience! Not only did it provide a unique opportunity to learn from the gurus in the field but the networking and interaction with CV experts, practitioners and enthusiasts (like me) alike was priceless. The venue was superb, as was the overall organization of the conference. Hats off to Adrian, the entire panel of speakers and attendees for making this event a reality and openly sharing their knowledge, experience and insights. Well worth the 27hrs of flying from Harare to San Francisco!! 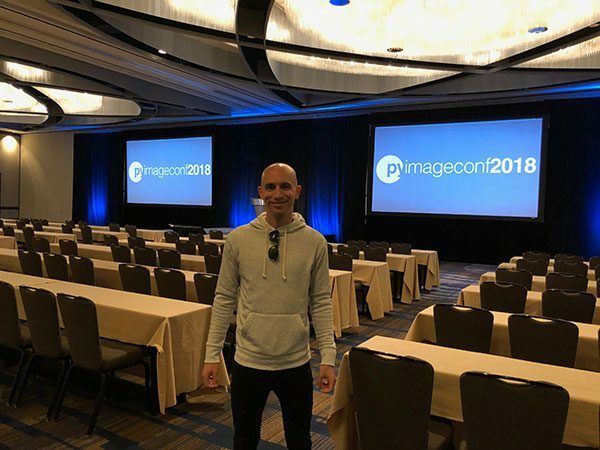 Looking forward to PyImageConf2019!?! 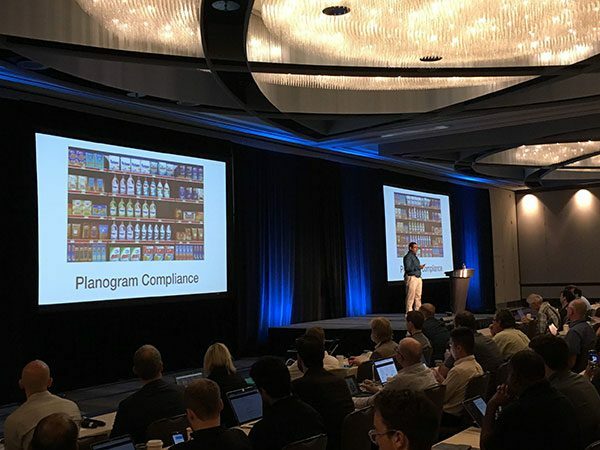 From consultants, researchers, to educators, PyImageConf captured the essence of Computer Vision. The speakers were super passionate about the topics that they were presenting and the wide range of topics will kept me wondering what will come next. More importantly, I was super impressed by the diversity of the people who attended the conference. 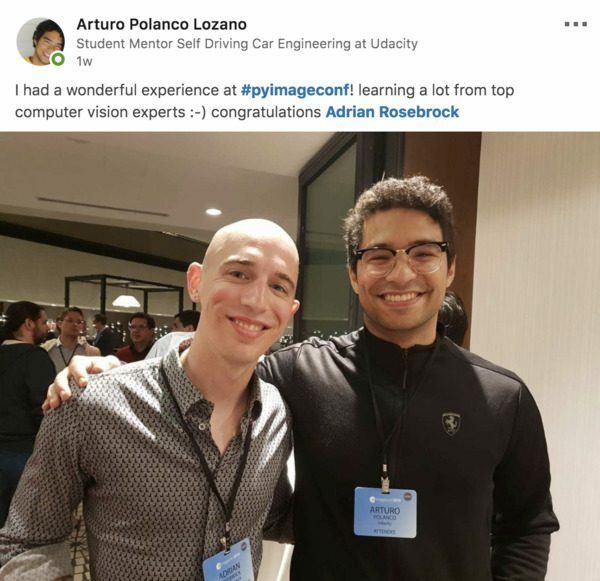 From graduate students, startup-innovators, and real company employees, I am deeply impressed by everyone’s backgrounds and interest in Computer Vision. 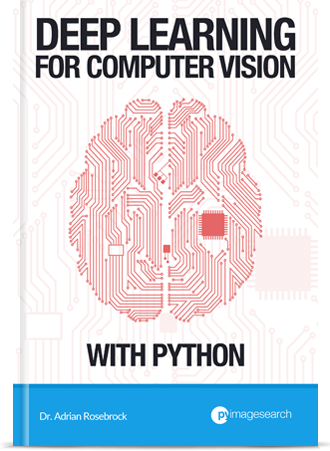 This is truly a conference that will inspire anyone who wants to learn about Computer Vision. It was a humbling experience for me to see that many PyImageSearch readers in a single room. The PyImageSearch community is so incredibly strong and supportive of each other and there were times where I started to feel a bit emotionally overwhelmed (in a good way) taking it all in. One aspect that I think we nailed is the age diversity amongst both speakers and attendees — that is something I would never want to change. Just as ethnic and gender diversity is important, so is age diversity. We all go through different life experiences at different ages and we all come from different walks of life. We therefore all have different experiences to share, both professionally and personally. The more diversity we insert, the more we can learn from each other. Figure 16: Me (Adrian) with PyImageConf co-host, Jeff Nova. Jeff Nova owns Colorhythm, an image processing and retouching company. Look how amazing this photo looks after Colorhythm applied their magic! Jeff Nova is truly a special person. He’s a colleague. A friend. And in many ways, he feels like an older brother I never had. Jeff co-hosted PyImageConf and shared MC duties. I couldn’t have done PyImageConf without him. He was always there to help, lend a hand, and ensure the conference was running smoothly. Jeff, if you’re reading this, thank you man. Figure 17: PyImageConf would not have been possible without Xander Castro, a truly excellent conference coordinator. Hysterically, we (totally accidentally) ended up matching during the final day of the conference! I could not imagine running PyImageConf without a conference coordinator. There are so many logistics to keep track of, so many bills to pay, so many people to keep in contact with — if I tried to do it on my own I think I would have regrown hair on my bald head just so I had something to pull out. 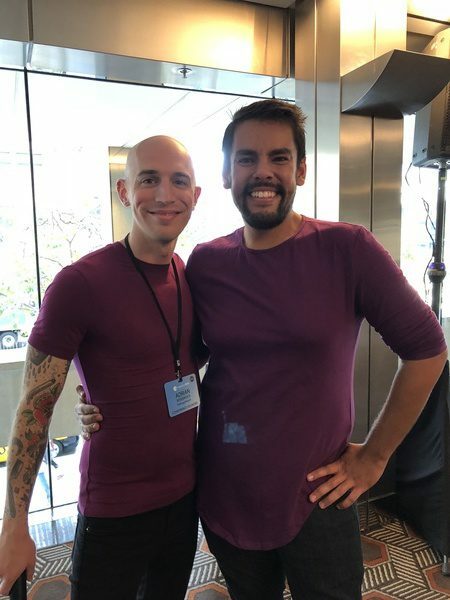 I have attended ~6-7 conferences in the past that Xander Castro and his company, Startup Event Solutions, have coordinated — and all of them were incredibly well executed and highly professional. 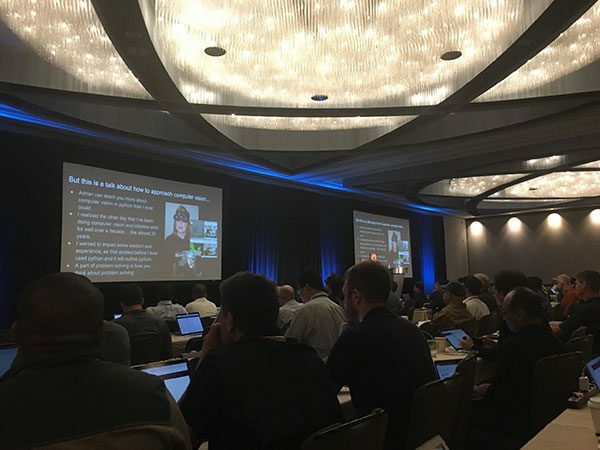 At one conference, right before lunch, there was even a fire sprinkler explosion, causing cascades of dirty, 40-year old water (that had been sitting in the pipes for decades) to drench an entire corner of the ballroom. Xander and his team were so on it that they had a new ballroom ready for us after lunch — the conference never missed a beat. Luckily, there were no sprinkler-related issues at PyImageConf, but it just goes to show you how good Xander is at his job. During the conference both David McDuffee and David Hoffman, two people you may have interacted with if you’ve ever emailed me before, were helping wherever they could, whether that was manning the registration desk, taking photos, or running microphones across the room to attendees who had questions. Without them I would have felt like my back was against the wall. They were a huge help. Tickets to PyImageConf sold out about a month before the conference, and then, about one week prior to the conference, Xander and I sent out a survey to allow attendees to signup for a particular workshop. The workshop registration was handled on a first-come, first-serve basis and some workshops filled up very quickly. Inevitably, there were a handful of situations were an attendee wanted to attend workshop X (their first choice) but it was already filled so they needed to attend workshop Y (their second choice). In the future I would like to provide a better, more efficient workshop registration process but it unfortunately creates a bit of a “chicken and egg” situation. What if their workshop changes in theme? What if they decide to cut a certain topic from the workshop? I don’t have a solution for such a scenario yet as it requires careful thought and meditation but I did want to share it as I do believe a better solution must exist. For hands-on work you obviously need a properly configured development environment. Workshop hosts provided details on how to configure your development environment prior to the conference; however, as we all know, configuring your development environment can be non-trivial at times. In Davis’ workshop in particular the first 30-60 minutes of the workshop was spent ensuring machines were configured properly. In the future, I believe this problem could be mitigated by providing pre-configured development environments which is something I would like to explore for a future PyImageConf. For some workshops it was harder for people to see the screen if they were sitting in rows farther away from the front of the room. After talking with Xander, he suggested in future years that we either have (1) one massive screen that everyone can see and/or (2) repeater monitors, two for each side of the room, so that no matter where you are sitting, you can easily see what’s going on via the screen. Xander’s solution is perfect and if there is a future PyImageConf, it’s something we will undoubtedly utilize. I’m not a big Slack fan — it’s one of those “necessary evils” that I use day-to-day, but I will say that utilizing Slack to help conference attendees connect and network was a big win. Inside the #meetups channel there were dinner, drink, and even exercise-related meetups going on. It was so cool to see friendships and bonds form outside the walls of the conference itself. Figure 15: PyImageConf — not only technical and rewarding to attend, but also one of the most friendly conferences around! A common theme heard from PyImageConf attendees is that it’s one of the most friendly conferences they have ever attended. I’m pretty introverted and have difficulty having conversations (sounds like cliche haha) but everyone was so friendly and easy to talk to that I didn’t have trouble socializing with the other attendees. The lunches and networking receptions really made the conference a great experience. For years I was an introvert and I struggled to put myself out there. Being social with people was truthfully a source of anxiety for me so I can appreciate what this attendee was feeling. For them to be able to feel comfortable in a social environment and network with others is a huge deal in my book. A very friendly, well organized, and informative conference. I enjoyed meeting a lot of people and learned from them. The hand-on workshop was a plus. The location was perfect, with a fantastic view of Bay Bridge and great food. PyImageConf 2018 was without a doubt the most friendly and welcoming conference I’ve been to. The technical content was also great too! It was privilege to meet and learn from some of the people who’ve contributed their time to build the tools that we rely on for our work (and play). Creating an environment that others can not only learn from, but also find super friendly is something to be proud of. The PyImageSearch community is nothing short of kind, accepting, and warm and I would never want that to change ? Will I host PyImageConf 2019? Figure 16: Nearly every attendee who came up to me asked if I would do PyImageConf again next year. I would call that a success. Thank you all for making PyImageConf possible! The next week I sent out a post-conference survey to get feedback from attendees. If there were a PyImageConf 2019, would you attend? 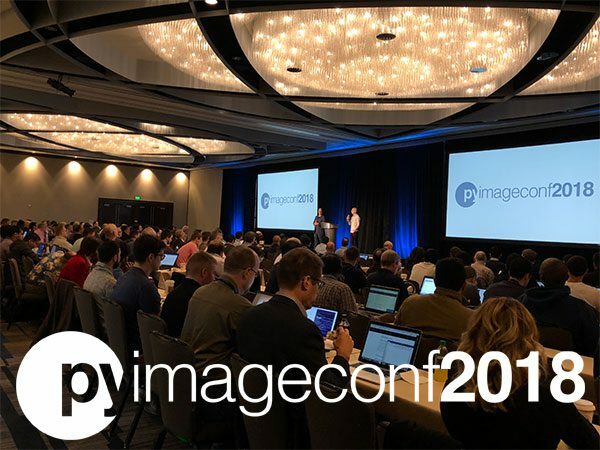 Of those who responded to the survey (~50%), 90% of attendees said, “Yes, I would attend PyImageConf 2019”. That is a huge percentage of attendees saying they would come back for the next year. Xander also confirmed that this was one of the highest numbers he had ever seen — and certainly the highest for a first year conference. Will there be a PyImageConf 2019? I’m not going to commit to anything just yet. Hosting PyImageConf, while incredibly rewarding and something I will always remember, was also extremely exhausting for me. I’m also writing this blog post on September 13th (~1 week before I’m getting married) so my brain isn’t necessarily in a place where I can forecast to 2019 — I’m mostly just focused on my soon-to-be wife. I think you pretty much have to. 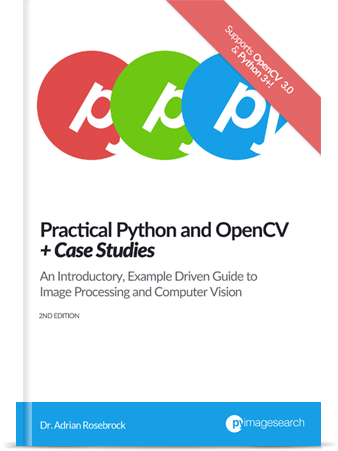 I opened both PyImageConf and today’s blog post by saying that the conference, blog books, and courses would not be possible without you, the PyImageSearch reader. You are all part of this family and I’m honored I can be on this journey with you. Will any/all of the conference’s talks be made available for those who weren’t able to attend? Hi Kyle — not for the 2018 conference, unfortunately. The talks were not recorded due to high expense and labor union requirements in California for recording (I think this has something to do with Hollywood’s movie industry). At a future conference Adrian might be able to set up recording capability. What about PDF’s of the talks? Are you referring to the slide decks? Or text transcripts? I would have loved to attend but finances and distance made it impossible for me. However, having read your blog, I just had to write to say how pleased I am for you and everybody involved that your event was such an overwhelming success. Huge congratulations all round. I hope participate at the next conference of pyimage. Why didn’t you use a small amateur camera like I did here for 350+ videos all around the world? Are these cameras and a tourist filming an event illegal too ? In august 2018 at Queen concert in MGM Park Theatre, Brian May made a super professional selfie with the whole concert arena and us and told us “See you on You Tube”. I’d like to get at least 1-2 more PyImageConfs in the United States under my belt before venturing internationally but it could be a possibility in a few years. Looks like a fun time! Cool, Adrian! I wish i could have a opportunity to be a member of your conf. 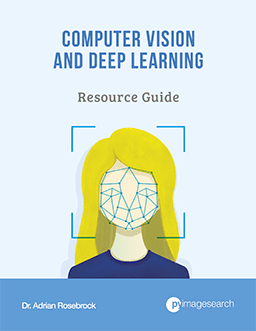 I think it’s a good chance to know the development of deep learning. I hope to see you there one day, Trami! Keep studying CV and DL and I know you’ll do great.